It’s Time D-Heads! This week we enter the game grid of TRON, and learn how to Be Excellent to Eachother as we welcome DAN SHOR (Tron, Tron: The Next Day, Bill & Ted’s Excellent Adventure, Star Trek, Air Force One) to the show! 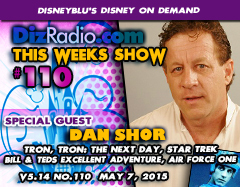 Dan stops in and talks about being RAM in the Original Disney Classic TRON, how he would love to be in Tron 3, being Billy the Kid in Bill & Ted and so much more! 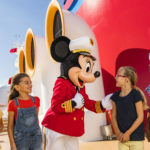 We also have the D-Team back as Erin dips his hands into the virtual mailbag in I Want To Know and Caitlin brings us the latest from the Walt Disney World Resort in WDW-In-2. We have Nathan here taking a look back in This Week In Disney History and Randy brings you a look at this week’s Disney Multi-Media. Jason digs deep into The Vault with another Blu-Ray or DVD to add to your collection. 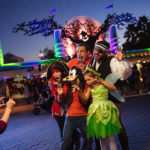 There is news hot off the D-Wire from Walt Disney World, Disneyland, Aquired Movies, D23, Hall 23, Star Wars Weekends, California Adventure, Animal Kingdom, Disney Channel, Phineas and Ferb and more.